Chocolate covered strawberries are elegant, romantic and delicious treats that can now be easily enjoyed using Sephra’s chocolate for chocolate covered strawberries. Sephra’s unique chocolate coating recipe ensures that the chocolate will harden quickly around the strawberry for a flawless presentation every time! Dipping strawberries in regular melted chocolate might yield chocolate covered strawberries, but the chocolate will need to set in the refrigerator and won’t set smoothly or with a shiny, professional-looking finish. In beautiful contrast, Sephra’s chocolate for chocolate covered strawberries quickly hardens around the strawberry, creating a shiny finish that will complement any dessert table. Sephra chocolate melts are perfect for making candy and chocolate covered strawberries because they are formulated with vegetable oil instead of cocoa butter.This chocolate hardens quickly, enveloping strawberries with a shiny, beautiful coat of chocolate.Even better, Sephra’s chocolate for chocolate covered strawberries is free of trans fat, making it a delectable part of a healthy treat. 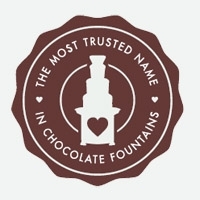 It’s not necessary to temper Sephra’s chocolate for chocolate covered strawberries, and it can be used easily with Sephra’s chocolate fountains so that guests can dip their own strawberries. Your guests can enjoy delicious strawberries dipped in decadent dark chocolate for chocolate covered strawberries, buttery white chocolate, or sweet milk chocolate for chocolate covered strawberries. Multiple smaller Sephra chocolate fountains can be arranged to offer guests a choice of each flavor or even a sumptuous combination. For instance, guests can choose strawberries dipped in dark chocolate and then drizzled with white chocolate for chocolate covered strawberries for a truly indulgent dessert! If you want to pre-make chocolate covered strawberries to arrange on the dessert table beside a Sephra chocolate fountain, you don’t have to use the chocolate fountain to melt Sephra’s chocolate for chocolate covered strawberries. Instead, melt them in a saucepan, carefully avoiding scalding the chocolate, and then dip the strawberries.With Sephra’s chocolate for chocolate covered strawberries, they which will harden up quickly to ensure that they are ready to display beautifully for your guests. Whether you pre-make chocolate covered strawberries or let your guests indulge themselves by dipping fresh, juicy strawberries into Sephra’s chocolate for chocolate covered strawberries, it’s always a good idea to make extra because no one will be able to resist indulging in a few extra chocolate covered strawberries!